Wonderful 18th century French quilt . One side an interesting and bold indigo flamme siamoise (linen and cotton) textile in two patterns, the other a block printed siamoise also with two designs. 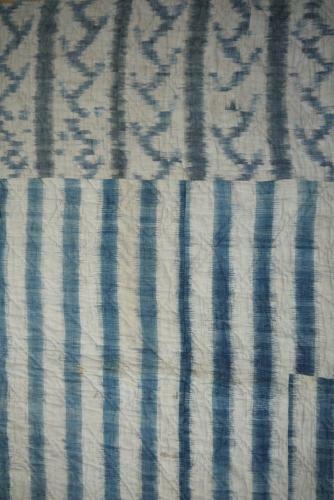 Block printed side in good condition with some repairs and darns.The striped flamme indigo side has many repairs and some stains but this dosesn't detract from its striking beauty.